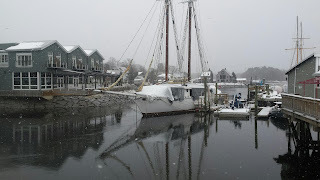 It is the morning after Solstice and this picture was taken in Dock Square, Kennebunkport, after stopping into a local candy shop. I almost never consider shopping in Dock Square, because it feels like something only tourists do, but it felt more like the holiday yesterday morning walking around the smal shops with the snow falling. It reminded me of the first time I drove through Dock Square in the 80's and was captivated by the little bridge, the boats, the smell of salt water, and the sounds of gulls. It is easy to understand why it is a favorite destination for tourists. I am not one of those who is at the beach, surfs or fishes on a regular basis, but when I am near the water, I wonder how it is that people can live away from it? Watching the snow fall on the shops, the overcast morning light, the smell of coffee coming from somewhere, it felt like the gentle start of something new, the yer beginning again, being at that point where you realize that every end carries the seeds of a beginning.